I bought the new DAM FSB Luxury figure recently, and it is a very nice and fully loaded figure. But the boots, although well made. Just did not look right to me, as the colour of the leather bothered me. 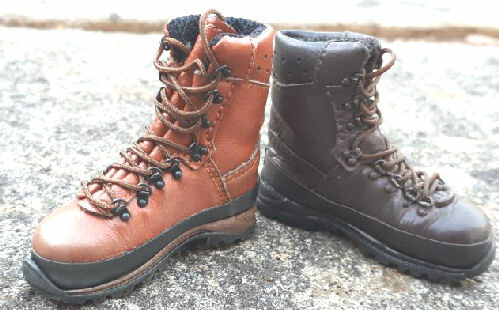 So I did a search online for any images of the type of boot, that it is supposed to be. And the nearest one I could find is in the picture on the right. And as usual with me I just had to see if I could re-paint the DAM boots to match the picture here. Picture 1. shows an extra pair of the boots as they came from the figure, that I bought loose to use as an experiment. To see if I can re-paint them. Picture 2. shows the main parts of the boot re-painted with Citadel Colour Scorched Brown 61-12 acrylic paint. This took a bit of time to do, as I had to paint as much of the boot as I could, and then let it dry for about an hour. That way I have found that the next touch up of the boots with the paint, it now has something to 'cling' onto. So that I can get a flat even Brown colour, and all of the original boot colour is hidden. I have found that the boot now has a semi-gloss appearance once it dried off, but I am not worried about that. 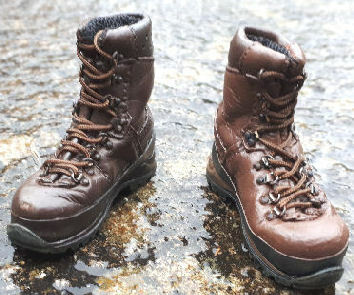 As I am going to use some Tamiya weathering powders to dull the boots down, and also add a weathered effect to them when I have finished. In Picture 3. I have had to re-paint the ankle pad on the rear top of the boot, and the Black rubber strip on the side of the boot. The two different Brown colours were each mixed separately, by trial and error to get a colour to match the picture above right. I have also re-painted the Light Tan band at the bottom of the boot, with another different mixed Brown colour. In Picture 4. I have used my model knife to scrape at the eyelets of the boot, to get the metal parts shiny and worn. I have also squeezed the boot together, which helps to crease it, so that I can really lose the new look of the boot. To help explain better about the boot changes I have done - Boot Repaint. I then used some Tamiya Rust weathering powder, scrubbed into the boot to lose the shine from the paint. On top of this I have given the boot a very light drybrush of the Tamiya Light Sand weathering powder. To add a dusty effect and to add slight highlights to the sewn edges. 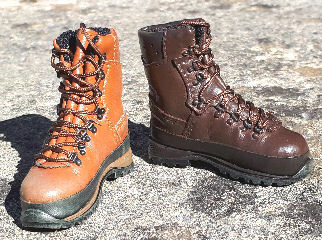 Note: Because I have only done one boot here to demonstrate how I did this, the hard part now is trying to match the mixed Brown colours on the other boot. 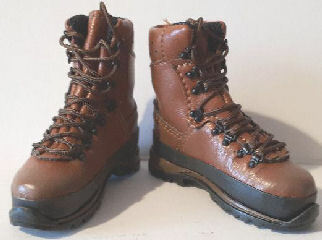 To add some more variety to my figures, I have bought another pair of the DAM FSB Luxury figure boots. As I wanted to repaint another pair of boots, with some other Brown acrylic paint. 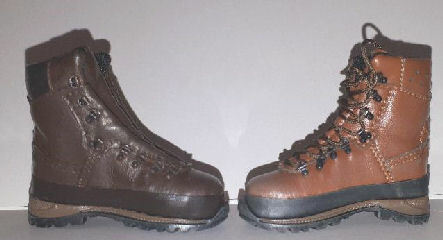 So it is a slightly lighter colour, and in between the two boots as shown in Picture 4. above. 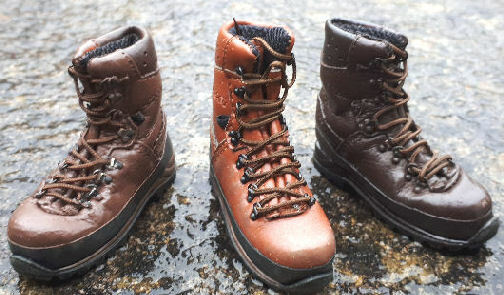 During my search for 1:1 hiking boots, I found a great variety of them, and I found that Tamiya XF-64 Red Brown is the nearest colour to the one that I want to use to re-paint these boots. In Picture 5. I am showing from the left, the new re-painted boot with the Tamiya paint. The centre boot is a new un-painted boot as made by DAM, the boot on the right is the one I re-painted earlier with the Citadel paint. Picture 6. shows how I have just finished re-painting the main boot pleather material with the Tamiya paint, and the top ankle pad was re-painted with the Citadel Colour Scorched Brown paint. After it had dried fully I squeezed the boot together to add the creases. Which helped to show up the parts that needed to be re-painted again. The strip above the boot sole that I have re-painted Black. 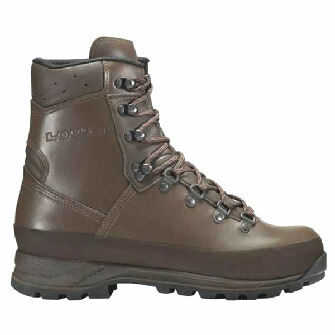 For this boot, I have decided to leave the strip below this in the original colour that came with the boot. The boots were like the others above, I used some Tamiya Rust weathering powder, to dull down the paint. I then gave them a very light drybrush of the Tamiya Light Sand weathering powder, to add highlights to the seams.